The pizza chef at Falora Pizza + Espresso doesn’t seem to mind. We’ve come in for a late lunch, and, since the Neapolitan pizza restaurant isn’t crowded, we stand and stare into the open kitchen as she makes the Giardino ($14) pizza we ordered. She picks up a square of dough, dusts flour on it and the counter, and quickly, deftly, works the dough into a small round. Then she begins constructing: A liberal amount of extra virgin olive oil, a gorgeous golden color, is spread over the dough. Next, sprigs of fresh oregano are scattered, topped by lots of fresh spinach, tiny cherry tomatoes, red and yellow bell peppers that had been roasted in the wood-burning oven, a generous sprinkling of sliced portabellini mushrooms, clumps of mozzarella, and, on top of it all, fresh Parmesan cheese shaved off a big wedge directly onto the pizza. She picks it up with the pizza paddle, slides it into the oven, and about three minutes later, it’s brought to our table. The spinach is barely wilted; the tomatoes burst with their juices; the cheese bubbles. There are pockets of extra brown crust, which are a tasty result of cooking the pizza in a wood oven. We pick up a slice. While the crust is knife-blade thin, it doesn’t sag in the middle, which often happens with Neapolitan pizzas – they are so thin it can be difficult for the crust to support the toppings. Then we take a bite. The crust is toasty; mozzarella oozes off the pizza; the tomatoes scream sweetness; the still-crisp peppers add a dimension. Not just that Giardino. We visited the restaurant several times, and not once were we disappointed. Ari Shapiro, the force behind the Xoom Juice smoothies shop and downtown’s Sparkroot, opened Falora in early March. He’s fashioned a cozy eatery out of a 1,000-square-foot space with exposed brick walls, a wood-burning pizza oven from Italy, and floor-to-ceiling concrete-brick shelving with cubbyholes stuffed with the pecan logs that feed the fire. The concrete floor means it can get loud if it’s crowded (as it can be at dinnertime), and in the evening a blinding sun peeks through the windows on the west wall. Shades might be a good idea there. 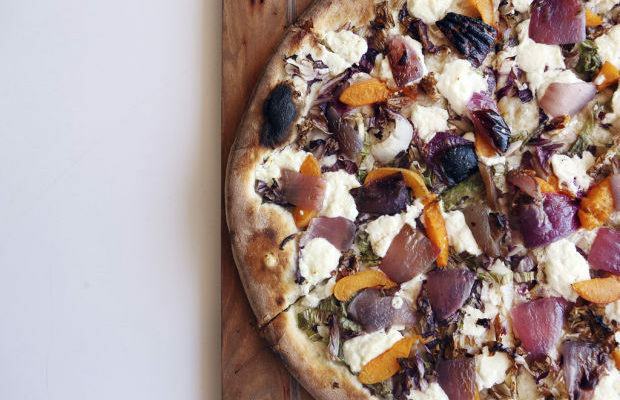 Vegetables – often locally or regionally grown – top most of the pizzas. The Margherita ($13), a classic Neapolitan pizza, is a simple piece of heaven, with just tomatoes, basil and mozzarella. The red sauce was used judiciously, allowing the flavors to shine. The Bianca ($12) forgoes red sauce and adds asiago to the basil and mozzarella. And on one of our visits, we ordered a special, which was drizzled with truffle oil and packed with mushrooms and sweet, smooshy roasted garlic ($14). Oh my. Meat lovers won’t be disappointed – the Cura ($15) is topped with an earthy soppressata given a bit of a bite with red pepper. The salami shares the crust with tomatoes, mozzarella, Parmesan and olives. Salads are given just as much thought as the pizzas. The kale ($9) is made with black kale, which is a common ingredient in Italy and is slightly sweeter than the kale we pick up in the market. It is tenderized with a massage of cashews and olive oil and tossed with olives, artichoke hearts and sun-dried tomatoes. And the butter-pecan salad ($9) is a symphony in flavors and textures – the butter lettuce meets up with spinach, fennel, apples and pecans and is tossed with an apricot vinaigrette. Service was thoughtful and informative – the waitress explained that the pizza crust is made with caputo flour, which the Italians use to make their pizzas; that the oven tops out at about 900 degrees, which is why the pizza cooks so quickly; and we might want to consider sharing a pizza and a salad – both were big enough for two. On another night, the waiter explained that they had been slammed with a large to-go order, which is why our pizzas were delayed. We saw Shapiro moving from table to table to let others know. Waiting is so much easier to do when an apology and explanation are offered. And when the pizza is this good. • Where: 3000 E. Broadway in Broadway Village, 325-9988. • Hours: 7 a.m.-9 p.m., Mondays through Fridays; 8 a.m.-10 p.m. Saturdays; 9 a.m.-8 p.m. Sundays. • Noise level: It can get loud when crowded. • Alcohol: Small selection of Italian wines, almost all available by the glass. • Family call: We can’t imagine the kids not loving it. • Gluten free: There are salad options. • Price range: The pizza tops out at $15.